MLB’s rules committee approved a resolution at December’s winter meetings to ban home plate collisions. The guidelines designed to eliminate home plate collisions are scheduled to go into effect this season. In the next few days, MLB will be making teams aware of the new rule. At this time, the general understanding that players and coaches are working with is that catchers can’t block the plate and runners must slide and can’t initiate a collision. Lefty spends a lot of time catching. He has even been involved in one minor collision at the plate. Nobody was hurt and there was no malicious intent. But still not fun to see your kid ran over. For young catchers and runners, this is a very serious play to master. For the fans the play at the plate is exciting. Runner on second base, base hit to right field, the runner rounds third heading for home, the catcher in all his gear keeps his mask on to provide maximum protection, the ball and the runner arrive at home at the same time as excitement fills the air. At this point, a number of things could happen in upper levels of baseball. The runner can slide, the catcher swipes a tag and the ump calls safe or out. OR, often the case, the catcher receives the ball, proceeds to put himself in front of the plate, the runner decides not to slide but lowers a shoulder. A collision occurs that can cause some form of injury…concussions, broken wrists, broken legs and arm injuries. You would think the runner gets the worst of it, but the catchers seem to be the ones who get injured on this play, geared up and all. They are very vulnerable. The runner has not violated a rule by not sliding when the catcher has the ball. 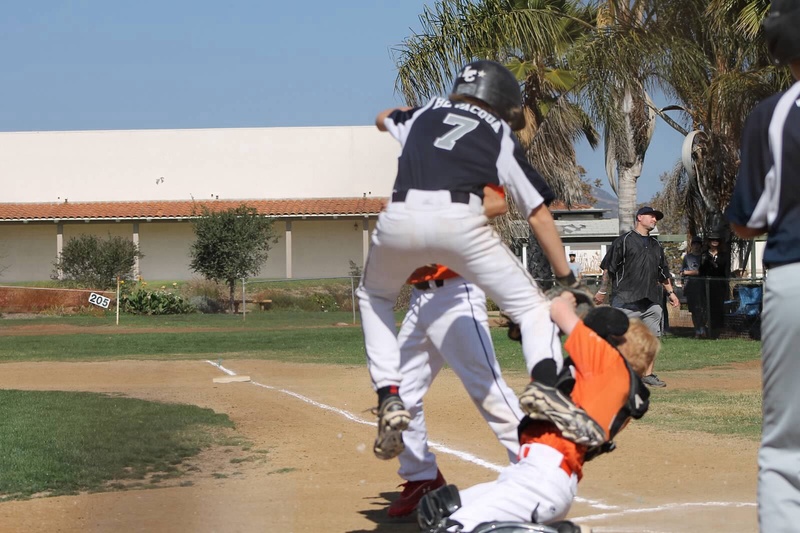 Most youth levels have a rule regarding collisions at home plate and bases similar to the Little League rule 7.08 (A)-3. The catcher is standing just off the line as the runner approaches. The catcher fields the ball, and starts to step across the line to tag the runner. The runner swerves to his right, trying to avoid the catcher, but the catcher continues his motion toward the runner, and the two collide. The fact that contact occurred does not mean that the runner is automatically out. In this situation, by swerving, the runner satisfied the rule — he or she attempted to get around the fielder. Of course, if the runner goes more than three feet to either side attempting to avoid a tag, then he or she can be called out under Rule 7.08(a)(1), but that is another matter entirely. Finally, read the last half of the rule again. For this paragraph to even apply, the fielder must have the ball and be waiting to make the tag. Thus, for example, if the runner arrives just as the ball is hitting the catcher’s glove, this rule probably doesn’t apply either. Only once the catcher is in position to make the tag does the runner acquire the obligation to slide or attempt to avoid. In fact, if contact occurs before the fielder has the ball, then the fielder is probably guilty of obstruction. There is no “must slide rule.” The rule is, “slide or attempt to get around.” The key in this situation is “fielder has the ball and is waiting to make a tag.” If the fielder (any fielder, not just the catcher) does not have the ball, and there is a collision, you CANNOT call the runner out. However, if the umpire determines that the runner deliberately attempted to injure the fielder, the umpire could eject the runner for unsportsmanlike conduct. Should be interesting when the MLB rule comes out. Sounds like these MLB plays at the plate will be more in line with youth baseball. Lefty’s coaches teach him to slide at the plate on ANY play. I agree with this teaching, protect the young players. As for MLB, if Lefty becomes a pro left handed catcher and there is a play at the pate, I would want the runner to slide into home.